Unsupported Patch 1.1 patches the North American retail release to 1.1. Not required for any other version. The config file is not in plain text format. Enabled/disabled, no description of method. Extract sr3.7z files to the installation folder (password=sr3). Edit sr3.ini to set the resolution. Supported exe size: 1 421 312 bytes. Uses DirectInput, XInput controllers may experience issues. Refers to the action and not the button tied to it. Option to enable or disable. Has on/off options for sound and music. Game pauses when focus is lost. 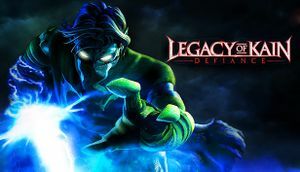 See Helix Mod: Legacy of Kain: Defiance. ↑ 1.0 1.1 File/folder structure within this directory reflects the path(s) listed for Windows and/or Steam game data (use Wine regedit to access Windows registry paths). Games with Steam Cloud support may store data in ~/.steam/steam/userdata/<user-id>/224300/ in addition to or instead of this directory. The app ID (224300) may differ in some cases. Treat backslashes as forward slashes. See the glossary page for details. This page was last edited on 29 March 2019, at 03:57.